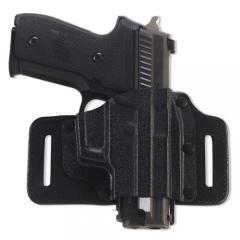 The Galco TacSlide® Belt Holster is a compact and economical concealed carry option that builds on the success of the KingTuk® IWB holster. The tough Kydex® pocket fits many popular double-action revolvers and semi-automatic pistols. It is attached to a smooth, premium steerhide backing that is flexible and comfortable for extended wear. The open bottom allows it to accommodate a variety of barrel lengths, while its open-top design and neutral cant allows a rapid and natural draw. The holster rides on the belt using a pair of belt slots, spaced widely, to pull it in tight to the body for maximum weapon concealment. I carry every day, every where and have for 43 years. Like this Holster better than any I have used.